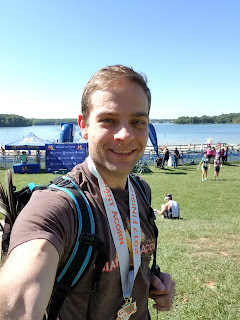 My marathon is in the past and it's time to start looking forward to my next race, a half marathon in beautiful Loudoun county. I decided to do this race pretty recently. I felt pretty good that based on my marathon performance (well, the first half of it, anyway), that I'd crush a half marathon. That's still TBD, as I have quite a few hurdles in front of me. First, I took off two weeks from running. I was biking and swimming during that time, but my first day running again I was quickly brought back down to reality and reminded why there was a mandatory 2-week cool off period built into my training plan. Suffice to say, it was rough. But I kept going - no hard runs, and nothing long. Easy runs at no set pace, just based on feel, from anywhere between three and seven miles. I've been doing that for three weeks now and I finally feel normal again when I run. 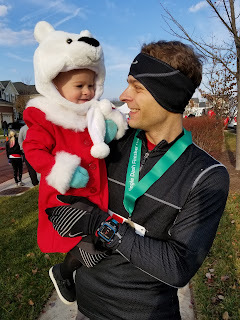 My endurance wasn't an issue (especially given the pace of my runs getting back into it), but the soreness was there, constantly reminding me that I'm not in my 20's anymore. As I mentioned, my body seems to have recovered, now five weeks out from the marathon. One hurdle down. My half marathon is in two weeks. When I signed up for the race, I had forgotten that I had schedule to donate blood this weekend. It was a Washington Capitals blood drive, and I wasn't about to miss out on a Nate Schmidt bobble head, so I went through with it. I realize that it's not exactly ideal to donate whole blood just two weeks before a race, but c'est la vie. This morning I did my first run since donating yesterday. 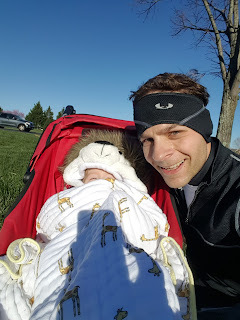 In addition to being down a pint of blood, I also took my daughter along for the ride, because I really wanted to feel bad about the upcoming race. It really is incredible what a difference the blood donation makes. I averaged a 7:52/min pace on this run for 5.5 miles. I've done this route, according to Strava, 65 times, so I know it well, and I know what the hills are like and what my effort is going to be like on it. Just last week, in fact, I ran this same exact route, but I ran it 45 seconds/mile faster and my heart rate was 10bpm lower. Essentially, after giving blood, what would have been a recovery run turned into a threshold run. It's going to take anywhere from 5-7 weeks before I have all of my red blood cells back (which is why they make you wait 8 weeks between donations). However, the Internet tells me that I'll have a few "sub-optimal" training days after donating, but I shouldn't see any ill effects after about two weeks. I just hope that's the case as I'd really like to PR this half.